For all you Al Purdy fans out there, here’s a Bravo!Fact short of his “At the Quinte Hotel” poem, starring Tragically Hip‘s singer/songwriter/poet Gord Downie. It showed at the Sundance Film Festival (I think in 2009). It’s an interesting rendition, rather humorous, as Al was known to be, and it’s obvious Downie’s enjoying his acting debut. I find reading the poem to myself more powerful, somehow better, but this is a fun bit of Canadiana for you (in so many ways, from the filming, to the star, to the film festival, to the poem, to the poet, etc. ), and it’s pretty cool to hear Purdy’s voice again. What excites me most is that the short was done in the first place. Off to read the Al Purdy A-Frame Anthology now! It’s well worth the purchase. Not only is it an excellent and well-laid out collection of photos, poems, anecdotes, and essays but also the sale of it contributes to saving the Purdy A-frame in Ameliasburgh—the most famous writer’s house in the country, where, Jean Baird writes, “hundreds of writers and their housemates found their way…to visit the Purdys and talk about poetry and history while downing beer or wild grape wine”—with the goal of making it a retreat for future generations of Canadian writers. A feel-good book in more ways than one! Who’s Who lists her hobbies as “‘mooching, lounging, strutting, strumming, priest-baiting and quiet subversion of the system,’ although she also enjoys obfuscation, sleaze, rebellion, witchcraft, armed robbery, tea and biscuits. She is not above bribery and would not necessarily refuse an offer involving exotic travel, champagne or yellow diamonds from Graff. She plays bass guitar in a band first formed when she was 16, is currently studying Old Norse and lives with her husband Kevin and her daughter Anouchka, about 15 miles from the place she was born” (taken from her website). Now I ask you, is there any more intriguing author description than this? I think not. As part of the Ottawa International Writers Festival, Harris is to read from her newest novel blueeyedboy and then participate in a Q&A, later open to the audience. After that you can get your book(s) signed (there’s a limit of 42 per person, artistic director Sean Wilson jokes, and thank God, because I brought five and had wanted to bring more), and then nestle back into your seats, popcorn on your knee, for a special screening of Chocolat, which is, of course, one of my favourite films. Before everything starts, I quickly visit the book table where Harris’s books are being sold and pick up a copy of Chocolat. Mine has the film cover, and I don’t prefer that for my books, but after deciding I don’t much like this other cover either and considering the sentimentality I have for my well-read copy, I put the new book back and return to my seat. I’m trying to remain calm but I’m buzzing. Harris has come all the way from Yorkshire (incidentally my favourite place on the planet) and this is her first visit to Canada, the first time I’m seeing her in person. And then I turn to my right, wondering where the throngs of fans are, and there she is. Joanne Harris, author extraordinaire, is casually perched on the arm of one of the theatre seats, clutching a gargantuan cup of what I later learn is Coke, sipping merrily through her straw while chatting with two other women. She’s smaller than I thought, topped with a close-cropped pixie, clad in a black soft leather motorcycle jacket, red blouse, and black jeans. The finishing touches: ballerina flats and a sparkling necklace. She looks edgy but sweet: a little dark with the light. How very like her. I realize I’m beaming. Joanne Harris looks to me like an imp, and I do not mean that in a bad way. Suddenly she laughs, and her youthful, vibrant face is instantly and amazingly transformed. She is one of those people who lights up when she smiles, eyes crinkling to crescent-moon slits. I want to gobble her up. I also want to go over there and meet her. But I’m looking about and not a single person aside from the two women with her, who seem to be involved in the event, acknowledge her presence. Either they don’t think it’s proper writers festival event etiquette or they’re too polite. They can’t possibly not know it’s her. But no one is even looking her way. I’m both flabbergasted and trying to swallow my racing heart. Aw, screw polite, I finally decide (I’m not totally Canadian anyway! ), and make my way over to her. I’m not missing out on this opportunity. I came three hours to see her, after all. Of course I’m a complete bumbling fool when I ask if I can interrupt and then try hard not to come across as the creepy fan who ends up in horror stories, or the Twihard-ish enthusiast. But I can’t help it. I’m practically vibrating with nervousness and excitement and I say stupid, inarticulate things. And then it’s Joanne being polite and calming me down by being so remarkably grounded and casual and making it seem as though she’s an old friend. She’s one of us. But I know there’s something special about her. One of the women obliges me with a photo of the authoress and me, which comes out looking as though we are two classmates goofing around in a photo booth. It is brilliant—until I realize later I had forgotten to save it. Merde. We chat about Yorkshire and I tell her I’ve brought her a taste of home—Yorkshire Tea—and she thanks me for being so thoughtful and says that had she had it this morning, her day would have been completely different: hence the giant Coke. Apparently we don’t know how to make tea here (I quite agree!). She tells me a story about Betty’s, where both of us have been, that makes me guffaw and thus embarrass myself. But Joanne Harris is full of stories, and before long we’re chatting and laughing almost like people who’ve met before. I’m enamoured, and suddenly I know that tonight will never be long enough to say all the things that have been building up for years. Especially since most of it won’t come to me till she’s gone. The lights dim and I return to my seat. The magic is about to begin. A spotlight illuminates the already glowing author, and she begins to introduce blueeyedboy, warning us that this is not a book about food, and it is not a book that takes place in France. It is not, in fact, even a book that many people like, seeing as they found no likable characters in it. With this, she elicits appreciative laughter from the mostly senior audience. Then she begins to read. In my seat I shiver with delight, listening to her round tones and alto voice as she enunciates the words she’s written as though she remembers the love of her craft, which she poured into this book. Her rich English accent makes me think of hot chocolate with cream and chili. I could listen forever. All too soon, the bit she is reading is over and she takes a seat, concession stand drink in hand, one leg crossed over another at the ankle. The questions are good, about blueeyedboy (though because the book has many twists, not much can be discussed at the risk of spoiling it for those who haven’t yet read it) and herself, too, and she answers them freely and off the cuff, intermittently taking sips through her straw. What we learn is that she is not at all like Gloria, a horrid woman in blueeyedboy, and that she does not like to be asked which of her characters she is. (This is understandable. People have this very interesting need to make books at least somewhat autobiographical regarding the author, which confounds me because it strips away the author’s very purpose, which is to imagine outside herself.) We also discover that a certain red evokes the smell of chocolate for her (thus she calls it chocolate red), and that she dislikes and ignores when people tell her she must write a certain way about certain things (e.g., about food and France). Listening intently, I realize with chagrin that I’ve been a very naughty and negligent girl having written a review directly after finishing blueeyedboy far too late at night and having read others’ reviews to feed my own. It’s irresponsible and unintelligent, and even kind of cheating, and I’m deeply ashamed. Of course the point was not to like the characters. Of course there’s deeper things going on than I allowed myself to process, having devoured the book as quickly as possible in preparation for this event. In light of having met Joanne and hearing her speak her mind, in remembrance of the brilliance of her other books, and thinking about the book in retrospect, I feel diminished, and look forward to racing home to delete or vet my review, as cowardly as that is. The things is, I’m still not sure what exactly I would change, even though it’s not a good review. I find myself also desperately wanting to chime in during the Q&A period, to get in on the conversation, to protest that indeed blueeyedboy does have food in it, and lots, as a matter of fact. There’s biscuits and pies and rotting vegetables and fruit and likely more I don’t remember, not only the vitamin drink. Joanne can’t help but include food, it seems (and I certainly don’t object). In fact, what I’ve noticed about all her books is how sensual she is: how prominent are the senses of taste and touch and smell and hearing. Colours also factor in many of her books, right from her first novel, The Evil Seed. These are thesis topics, methinks, and though it’s been ten years since I graduated from uni, I think I may yet pursue them. One audience member asks her question in French, and without hesitation Joanne answers her back also in French, with an impeccable accent. Of course I knew she could speak it, but for me to hear it, and for her to have the opportunity to do it here in Ottawa seems meaningful to me. Even more so when the audience obviously understands her answer. Finally, it is time for her to sign our books. The lineup isn’t long but, sadly, neither are there many in the audience. “Better than Glasgow,” Joanne said to me earlier, where only two men showed up, and one of them to escape the weather. Nothing could be worse than Glasgow, she said wryly, though apparently she still managed to enjoy herself. Gamely, Joanne signs all five of the books I’ve brought and takes two more photos with me, unfortunately neither as good as the one that got away. She accepts the Yorkshire Tea as well, but only one teabag to sneak for breakfast next morning. Much to my pleasure she remembers the story of my copy of The Evil Seed, which was out of print until recently and is still unavailable in Canada. I’d written her about how I acquired it a few years ago, and now looking at it she tells me that only 1000–2000 copies had been printed, and only in the format I own. I have in my possession a rare book indeed, and now it’s signed. Too bad it’s also stamped by the Nipissing Public Library. I can’t stay for the viewing of Chocolat, as much as I would like to. I am happy at this event, with Joanne, mingling with other people who appreciate good literature. I’m in my element, and I know in my heart this is where I ought to be on a regular basis, among authors and good books, and people who love to read. But I am staying with a friend, who eagerly awaits my report on the evening. Amid moviegoers trickling in, I leave the theatre and Joanne, stepping out into the cool night regretfully but also exhilarated, and at the same time somehow knowing I will meet her again. Joanne Harris is not a woman one easily forgets, her magical writing not so easily put aside. I feel certain that her next book, or perhaps the next after that, will have me not on the train but rather boarding a plane for Yorkshire. I’ve posted here several times about one of my favourite Canadian poets, Al Purdy (just do a search at the top of this blog), and after reading this excellent and inspiring article, I’m doing it again. Several times throughout the article, Marnie Woodrow observes that Canadians seem to suffer from cultural apathy, and when I first read that, my heart began to pound. It’s exactly the reason behind my concept of Biblio: a bookshop/literary hub to preserve but more importantly encourage and grow support of our literary contribution to this world. This means promoting not only Canadian literary output but also that which is tied to it, like Al Purdy’s A-frame house, once a meeting place of literary genius, now threatened by Canadian disinterest. As Woodrow mentions in her article, Purdy’s wife Eurithe promised him that she would turn the A-frame into a writers’ retreat, and while her efforts are bolstered by hardworking individuals like Jean Baird and George Bowering, who initiated the project to save the A-frame, and by Harbour Publishing, there is yet a sense of urgency, of struggle in making this happen. Why don’t we care about stuff like this? The million-dollar question. I’m not a writer looking for a place to work on my novel or chapbook (yet). But if I were, I would definitely want to be creating at the A-frame, where the ghosts of past literary celebrations were held and the muses still reside, in among the chittering chipmunks and whispering pines and by the peaceful lake. I feel a sort of desperation in me when I read about things like this, the kind you get when you find a cause you firmly believe in. My own financial situation is too close to where the Purdys found themselves when they first started out, but my plan is to begin support by buying the Al Purdy A-Frame Anthology, published by Harbour, since the proceeds will go toward saving the A-frame and helping Eurithe fulfil her promise. Then I hope to convince a local bookstore to participate, one where I plan to be working very soon (discussions as to how are in the works — woohoo!). The library could be next by way of working together to garner support. If I can start now to cultivate the type of atmosphere and mission I envision for Biblio, I’ll be a happy woman with a purpose. Helping save the A-frame and thus provide a place for Canadian writers to produce their works while at the same time honouring Purdy’s own contribution and attempting to banish Canadian cultural apathy sound like very worthy causes to me. There is no harm in thinking big. After all, that’s how Purdy and the rest of our literary notables started out. Happy National Al Purdy Day! Today marks the tenth anniversary (already!!) of Canadian icon poet Al Purdy’s death, and is thus deemed National Al Purdy Day. Harbour Publishing writes on their site that “Purdy fans across the country are planning their own “Purdy Parties” to help raise funds to protect Al’s old A-frame home in Ameliasburgh, Ontario as a writer’s retreat.” I wish I’d read that before today. I’m an Al Purdy fan, living in Al Purdy country. If you like, you can read my little tribute to him here. Now, I’m not about to celebrate his significant contribution to Canadian literature by cracking open a beer in the Quinte Hotel in Trenton (about 15–20 mins. away and the site of one of his poems), but I will grab his Collected Works and read a poem or two in memory. I wish I could donate to keeping his A-frame house in Ameliasburgh from being turned to scrap. That house has seen a lot. I wonder what Margaret Atwood is doing. Perfect Peggy and Awful Al were friends. The first thing I said to Jessica Grant when I met her this evening at the Belleville Public Library was that I was a huge fan. I was sweating, breathing heavily, and highly excited. I was also talking very loudly, so I had a bit of an audience, even though I was early and one of the first to arrive. Okay. Probably frightening. But I had run from my workplace about ten minutes away, loaded down with bags and books! I had been afraid of being late (I lost my watch somewhere today). To be fair, though, she didn’t know that. For all she knew I was one of those people to watch out for. Oh, those ones. Yes. For all she knew I was…odd. And I kept gushing but inside, really, I was kicking myself under the table. “I’m a huge fan”? Ugh. I mean, this is not Stephenie Meyer we’re meeting and I’m not 13. No, this is Jessica Grant: calm, cool, genius Jessica Grant, who does not wear her matching sweater to every reading and book signing (I can’t even believe I asked about it). You do not gush like a fool, you do not show off how much you know about her—you beautifully articulate how much you loved her book and why you enjoy her writing. Punto e basta. But I’d already started off wildly enthused and bumbling and there was no stopping me. In my defence (my poor friends were embarrassed, I think, by my behaviour) I have to say that none of it was exaggerated or dishonest. All day long I had been excited about meeting Grant, the author of Come, Thou Tortoise, my favourite book of the year. I truly felt as though I was in the presence of an amazingly talented woman (well, because I was) who possesses the power (times sixty) to imagine such incredible things and render those things with exactly the right words in unique and wonderful ways that speed their way directly to your heart. I am jealous of this. Time and again while reading I was struck by how beautifully the characters spoke and expressed themselves. I wondered briefly—as I stumbled over my words and asked her to instead just read my review here on the blog and would she please maybe comment too and also sign my book and also take a photo or two with me—if she thought I was “too much.” She was so gracious and down-to-earth and calm. In comparison, I felt too in her face, too touchy, too scarily enthused, perhaps too strangely unlike most booklovers of literary fiction (you know the type). To her credit she did not scrunch her face and back away slowly. So, then, meh, what of my geekiness, I decided. This is who I am: in love with this book and her writing, and extremely happy to be immersed in some way in the book culture again. I wish so much that more people would be this supportive, to be honest. Every author needs at least one person who believes in their book this way! If I were a published author, it would mean the world to me, and if someone liked my book I would not want them to be shy. I would not say no to a picture or two. Anyway. To my disappointment, there were not a lot of people there. Sigh. O Belleville: once again you disappoint me. How can I open a bookshop in this atmosphere? Then I decide, no, this is exactly the atmosphere I want because then I have a heroic mission; I can wake up Belleville and get them excited about our Canadian authors. Excited times ten. When we finally got started, I found myself desperately wanting Grant to feel comfortable and accepted and appreciated—and I worried for nothing, in spite of the number of people who showed. She was undaunted, good-natured, professional, smooth, and unwavering. She gave us background on the book, answered questions she said people mostly asked her, and then read to us the first two chapters. I wanted her to keep going. I would have sat there till she’d finished all 412 pages, to tell the truth. She read well and elicited much laughter, and later applause. It was almost as though I was hearing the book for the first time. Then Grant fielded questions from those in the audience. She spoke about her writing insecurities and about certain fears and how she’s transferred some of those fears into the book, particularly flying (which she both loves and fears: imagine being killed by something you love. Imagine that something not loving you back. Imagine). She answered the inevitable autobiographical question (no, Oddly is not anyone in particular but, yes, she shares some characteristics with Grant). She discussed Winnifred and how the irresistible tortoise sort of appeared later as she was writing, and she described the misgivings she had had about writing a talking tortoise (would it be too Walt Disney. No. ), and how Winnifred is another (more intimate) look into Oddly and Cliff and Chuck and Linda. Grant also carefully addressed the relationship between Walter Flowers and Uncle Thoby, asking first for the question to be clarified. What exactly did they want to know? It was obvious Grant did not want to give too much away, did not want to impose any interpretation over another’s, perhaps did not want to enter into a discussion about possibly gay relationships. This was wise on her part, I thought—that is, to deliberately keep things ambiguous. Grant’s mentioned before that the book doesn’t answer all the questions for the reader. Oddly asks some but also doesn’t think to ask others, and as much as Oddly fancies herself a kind of detective, this was no Flavia de Luce novel. Ambiguity, for me, is what makes a book rereadable. I wish I’d thought more ahead of time about questions to ask, good ones, not silly ones, and I’ll probably think of them later, knowing me. I also wish I’d taken pen and paper so I could have written what she’d said so I could have quoted her here. But I did find, thankfully, that much of what she said I’d read elsewhere. And because what she expressed is important, I’ll share it with you so you can read it for yourself, in her own words. Below you’ll find links to some of Grant’s National Post guest editor pieces, and also a bonus short story, excellent of course, called “Humanesque.” Plus, I’ve included a link to Random House’s New Face of Fiction page for Jessica. At the bottom is a video in which she says some of what we heard in person tonight. Read, too, on BookLounge’s blog, how one book club honoured Grant and her book. Oh, and one more (important) thing. Grant is working on a new novel. No, I have no clue what it’s about. She won’t say. And no, it does not have a tortoise in it (yet) and it is not a sequel to Come, Thou Tortoise. I do not know if the wind sings in B flat or if swans search for the bottoms of ponds (Can you see the bottom. No. Can you.) or if there are magical strings of Christmas lights in this new book. I doubt it. But I can’t doubt there will be cleverness and humour and wordplay and tenderness and beauty in her new book. Even without a tortoise and a girl like Oddly, and even without planes and kissing pilots or horses’ hooves that are like exposed hearts, I would not say no to a new book by Jessica Grant. Before she left, I did what I felt compelled to do, as I had done with her book when I finished it: I hugged her. Thank you, I said. She said it was nice to meet me. And then, as she walked away, she looked over her shoulder and added, making my night: I’ll never forget you. And I don’t mean that in a bad way. National Post Guest Editor pieces: Jessica Grant (here is one link, and you can click on the others below the article. Don’t miss a word! Making Light of Tragedy: Jessica Grant’s short story collection. Yann Martel, author of the brilliant novel Life of Pi, has a very interesting and extraordinary project on the go. It’s called What is Stephen Harper Reading? Every two weeks, for as long as Harper is prime minister, Martel will send him a new book to read, accompanied by a letter. (I’m extremely jealous!) He’s sent 74 books so far and had about six responses, not one of them from the prime minister himself. You really should check out this site. It’s simultaneously humorous and not at all funny. You’ll see what I mean. It’s quite thought-provoking, in fact. My main point for this post, however late I’m getting to it, is this. I just read the About page, and it made me think of the post I wrote only last night. While it is a very interesting and provoking About page, and the entire script made me feel somewhat perturbed (ironically: it’s about being still but I felt moved to do something, though I don’t know what), here is the paragraph that spoke to me most at this particular time. Be still and think about that for a while. Since it’s going to be some time before I can finance the bricks and mortar version of Biblio, I’m going to start the shop online. I may have already mentioned this, but I’ve been dreaming of this for years now and I can’t stop thinking about it. The very idea makes my heart race. I can’t wait! Impatience moves me, so tonight I drafted up a skeleton plan of what I want the Biblio site to contain. And then I remembered with a start that Biblio is actually not unheard of, probably even quite a popular name online, and I needed to find a domain I could use. After trying several domain names and finding them unavailable, C and I finally decided on www.bibliobooksandtea.com. To me, it’s perfect. It sounds just right and there’s no guessing as to what the site is, either. This is it! And whoa, do I feel excited!! I’m not sure yet whether Bella’s Bookshelves will eventually morph into bibliobooksandtea to give it some history. I might borrow from it, anyway, or keep it as is and make it a sister blog. There’s still planning to do for Biblio online and the design as well and contacting other sites as either suppliers or for permission, etc., but the process has been started. And yet, I’m SO ready. I’ve been feeling nostalgic lately, particularly for the literature I used to read more, the literary events I used to frequent, the literary talk in which I used to participate much more often. University was a fertile ground, and on being out of it now for ten-plus years, I can say that I’m almost having to start that garden from scratch. Almost. Unable to contain myself any longer today I leapt from the supper table and went to pull from my shelves my favourite book of poetry: Beyond Remembering: The collected poems of Al Purdy. I’ve seen and heard Purdy read twice, and what I remember most was laughing, and wanting to kiss his cheek, and thinking him a dirty old but very sweet man. I remember him half blind at the time, too. His poetry, his writing in general, is frank and honest, unafraid, humorous, thoughtful, observant, beautiful. Read his own preface to BR and you’ll know just what a man he was. I wish I could have really known him. He was what they call “a character,” and his personality comes out very much in his writing. It’s still my great pleasure to have heard him, to own a signed book (The Cariboo Horses, a lovely find, unfortunately not signed to me. My own signed copies disappeared along with my first husband), and to have one day spoken (rather breathlessly and incredulously but after all I live in Purdy Country) to his wife when she phoned Chapters where I worked at the time, looking for a copy of her late husband’s book. Poetry is a very personal and intimate thing, so of course Purdy’s musings aren’t for everyone. But he is nevertheless a Canadian icon, perhaps mostly because of his observant studies of the country’s landscape, politics, and people. Landscape is always a big theme in Canadian writing. Atwood’s been one of my favourite authors since…well, forever. I love her writing, and I love how prolific she is. 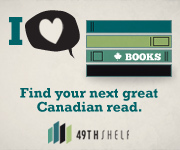 You’ll find novels, stories, articles, CBC Massey Lectures, significant bits and bobs of all kinds everywhere. You have only to glance at this list to see what I mean, and it’s probably not even complete. I could wax poetic about this beautiful and amazing woman, this wee powerhouse of brains and creative talent. Her voice—that is, her tongue-in-cheek and direct style—thrills me. Margaret Atwood is not afraid to think and ask questions or to speak her mind. She is an active contributor to bettering not only Canada but our world. One of Atwood’s interests, as you might already know, is the state of our world. She talks environment. She speaks politics. She writes, perhaps surprisingly but very successfully, about debt. Atwood’s also known for uncannily predicting the future (though maybe it’s not so uncanny if you, like her, are paying attention). As a result of her important reflections and contributions, Atwood was recently announced a winner of the World Economic Forum’s Crystal Award in Davos, Switzerland. The conference where the award was presented was called Improve the State of the World: Rethink, Restate, Rebuild, and the purpose of the meeting was to recognize artists who have used their art to provide significant insight and effect positive change. Unfortunately, apparently due to time constraints, acceptance speeches were cut. You can find Atwood’s speech here. If you know Atwood only as a dystopian novelist because you were told to read The Handmaid’s Tale in school, I dare you to venture beyond that and see what else she has to say. You might be surprised to find more than you bargained for, and a voice you support. PS. Already a Margaret Atwood fan? Check out her lovely new set of Bloomsbury editions! One of my favourite books will always be Catcher in the Rye (you should see my dilapidated copy! ), which I first read as a young girl, and which most people know was written by J.D. Salinger. I’m sorry to be a day late on this but I’m sad to announce the famous author passed away, at the age of 91, on January 27, 2010. It is reported that he was healthy but experienced a sudden decline this year. Like many of us, Salinger was apparently very attached to Catcher in the Rye, and passionately disallowed a film adaptation as well as a sequel to the novel. I have to say he won my heart with these actions as well as his book, because I love to see an author stick so strongly to what he believes in, which in this case is the sacredness and preservation of his art. That’s not to say I don’t appreciate some books made into films (although I won’t read a sequel unless it’s by the original author) (my favourite adaptation is probably Tolkien’s Lord of the Rings, but I wonder what he would have said about it?). But Salinger’s book meant so much to him he cared nothing for fame and advancement. In fact, he was reclusive, and hadn’t published anything since 1965. There’s something to an author who produces only one novel, that then becomes wildly influential and successful and even, later, famously banned, and then never publishes another (stories yes, but not a novel). It’s as though that particular book was destined to come from him, as though it was his purpose to produce it. He was otherwise a reluctant success. But that’s not to say he was a reluctant writer. Although writers becoming wildly famous such that they are constantly in the spotlight does excite me because it means that people are still reading, I also have a deep respect for those writers who write solely for their personal satisfaction. In 1999, Salinger’s New Hampshire neighbour Jerry Burt said the author had told him years earlier that he had written at least 15 unpublished books kept locked in a safe at his home. “I love to write, and I assure you, I write regularly,” Salinger said in a brief interview with the Baton Rouge Advocate in 1980.